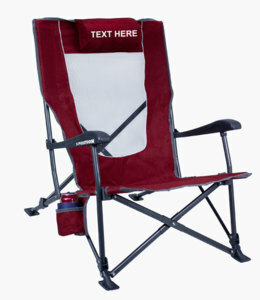 Personalize this chair with one or multiple lines of text. A special gift for a special person... or your own personal seat. Make it truly your own creation by selecting from our many different font styles, letter and chair colors. 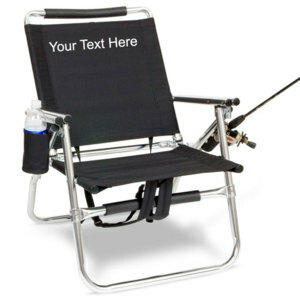 Click on tabs below to view more information on this chair's description as well as personalization information. 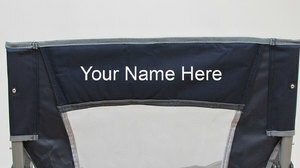 Imprinting cost is $12.00 per line and will be added to the base cost of the chair shown above. Location: When seated, the inside is where your back touches. The bag is the carry case for the chair. INSIDE: Up to one line of text allowed, 12 characters per line. Imprinting area is 10" wide by 2" high. BAG: Up to two lines of text allowed, 24 characters. Imprinting area is 14" wide by 4" high. 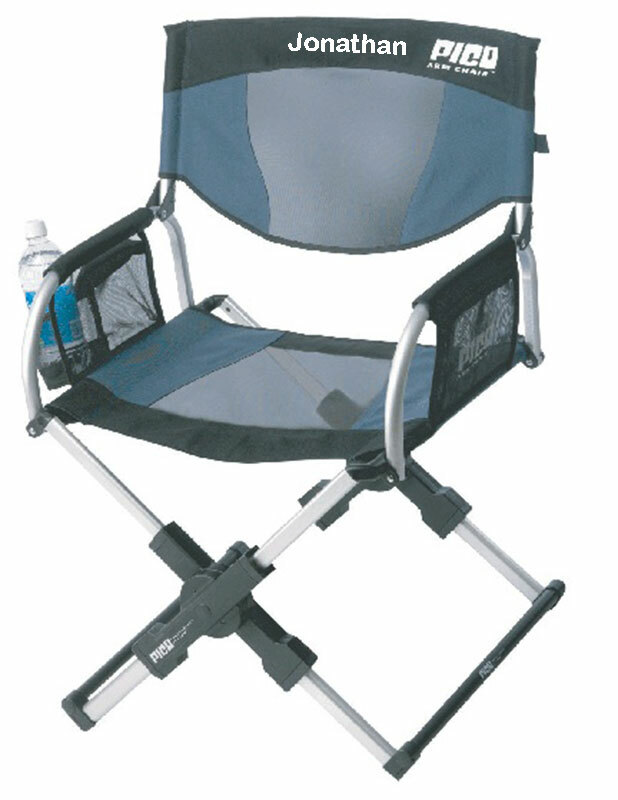 Feature Easy fold up chair, can be taken anywhere. Can be personalized. NEW! Want to see what your custom chair will look like? 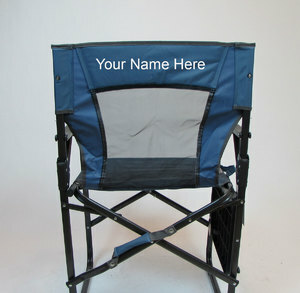 Visit our Chair Designer by clicking the "Start Designing" button above to the right. Please read instructions first by clicking the "Chair Designer Info" link. Description - The heat imprint process is just like sign making - letters are cad cut from vinyl and then applied to the canvas under high heat and pressure, fusing the vinyl into the fabric. Many different stock vinyl film colors are available for the letter color as well as many different fonts. The result looks almost identical to silk screening and is just as durable and professional looking. Location - The imprinting can be done on various locations depending on the chair; such as the pillow, the backpack flap, the carry bag, etc. The most common place is on on the back and in relation to the back: The INSIDE is facing forwards or where one's back would touch when sitting in the chair. The OUTSIDE would be facing backwards and seen from the back of the chair. Of course, on directors chairs the back fabric just slips down over the posts of the chair and can be turned around if you like, but the back does have a conventional front and back. The outside is the side where the loops are folded around and sewn. Personalization Pricing - The Imprinting Charge is the charge per line of text. If you desire more than one line or on both sides of the canvas, additional imprinting charges will be incurred. There is a maximum number of characters allowed per line according to which chair you are buying. Please be aware that the more characters there are, the smaller the letters will be. However, we will try to make the inscription as large as possible within our limits. Please Note that for a small charge we can use different fonts and/or thread colors per line if you desire. Please call us at 866-732-8246 for more info. Ordering Instructions - Fill in the appropriate boxes and when you add the chair to your Shopping Cart, the final price will be displayed. If you want duplicate chairs, you can change the quantity next to the Add To Cart button or in the Shopping Cart. If you want different chairs, then finish one chair at a time with personalization information, add to cart, and then return to add the next one. Shipping Schedule - Imprinting is done in house and can ship quickly. Normally, orders are shipped out within one to two business days after the order is placed. Same day shipping is available for a $25 rush fee and must be placed by 12 noon EST. Revolutionary technology in portable chairs - folds down to laptop size. It's carry on luggage size! Rigid hybrid frame design supports 250 lbs. PICO means small. And that is exactly what this chair is - a full-sized chair that compacts to 1/16th it size! The PICO folds easily using the Patent Pending PICO Telescoping System?, an innovative technology developed by GCI Outdoor, Inc. 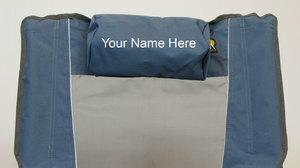 This chair is easily portable with its own travel bag that doubles as a Chair Back Storage Caddy?. There is storage for your magazines, notebooks, cell phone, water bottle, etc. Also included is a cupholder and storage pouch conveniently located on the armrest. The PICO is the world? 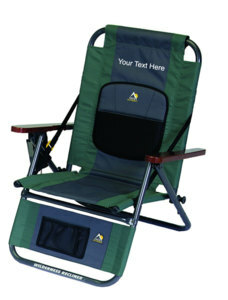 ?s first full-sized chair small enough to take with you on every adventure.